A Hawaiian BBQ Pork Walking Taco is easy to make and full of flavor. 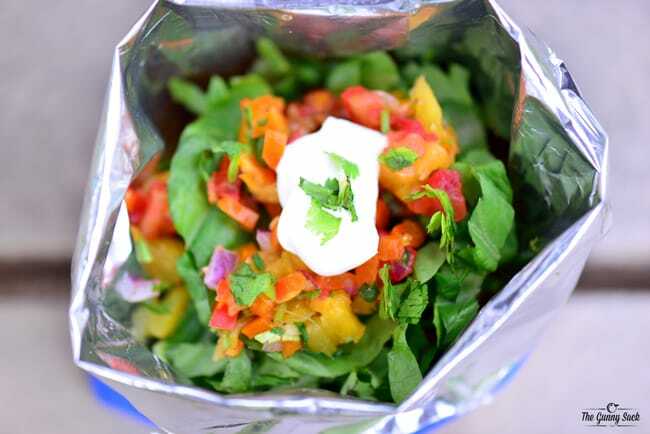 This walking taco recipe is perfect for feeding a crowd at a backyard bash or party. Sponsored by Byron’s Pork BBQ. 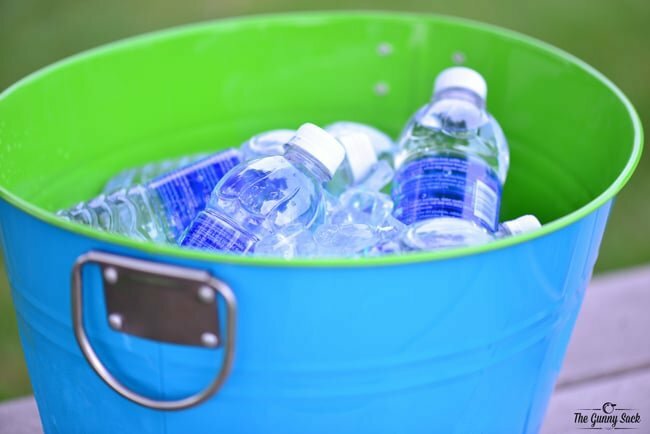 Summer is the best time to have friends and family over for a backyard bash. The weather is beautiful and everyone can enjoy spending time together outside. One thing I know about summer entertaining is that you want it to be as easy as possible. 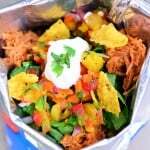 So I’m sharing a crowd-friendly recipe for an easy, delicious Hawaiian BBQ Walking Tacos. For those of you that don’t know, a walking taco is a taco in a bag. It is assembled in the bag and then eaten out of the bag with very little clean up! 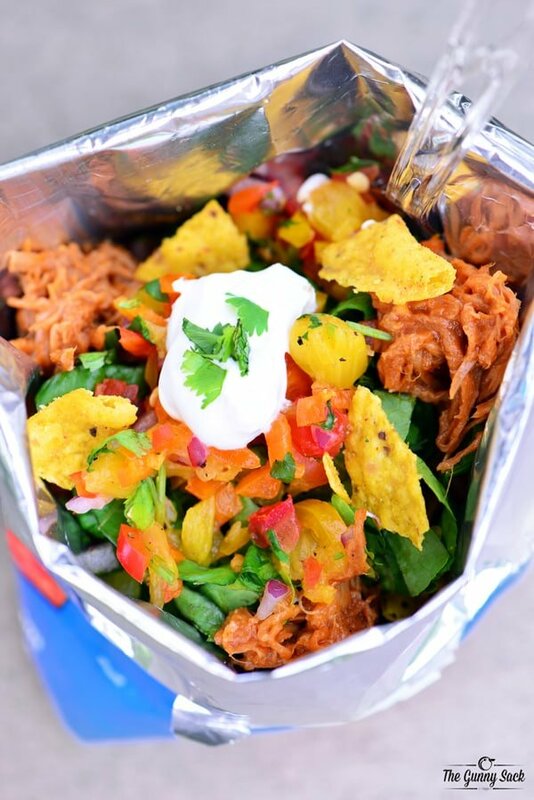 To make these walking tacos even easier, I used Byron’s Pork BBQ. 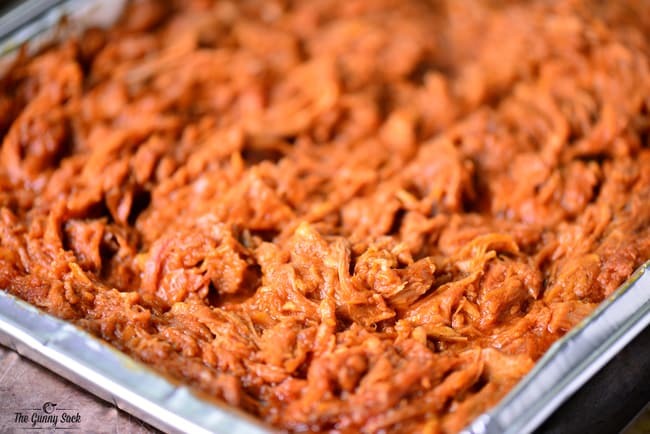 Byron’s has been making authentic American barbecue in Gallatin, Tennessee, since 1957. They slowly smoke quality meat over an open-pit hardwood fire and then slather on their signature spicy-sweet sauce for an amazing flavor. 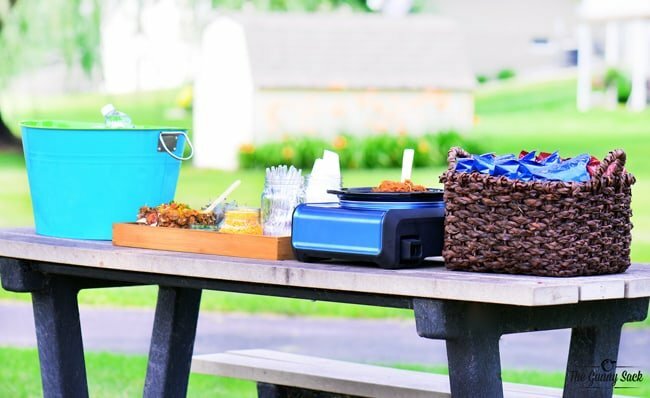 You can throw the perfect backyard bash this summer with the help of Byron’s BBQ available exclusively at Sam’s Club. I made the barbecue pork in my oven following the instructions on the package and the house smelled amazing. It can also be warmed in a slower cooker or on the grill. 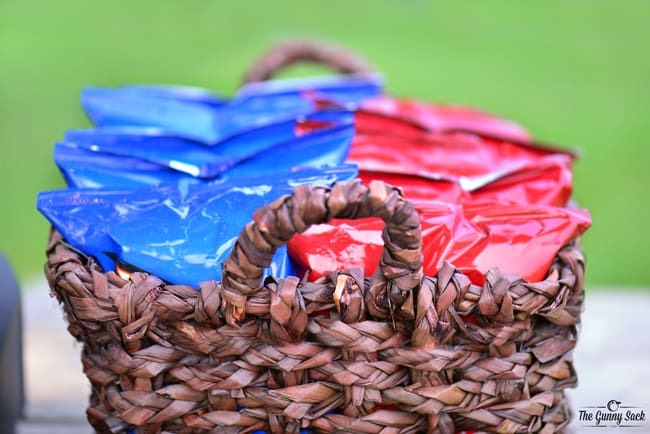 Once you are ready to eat, set up a walking taco bar in your backyard or at a park. 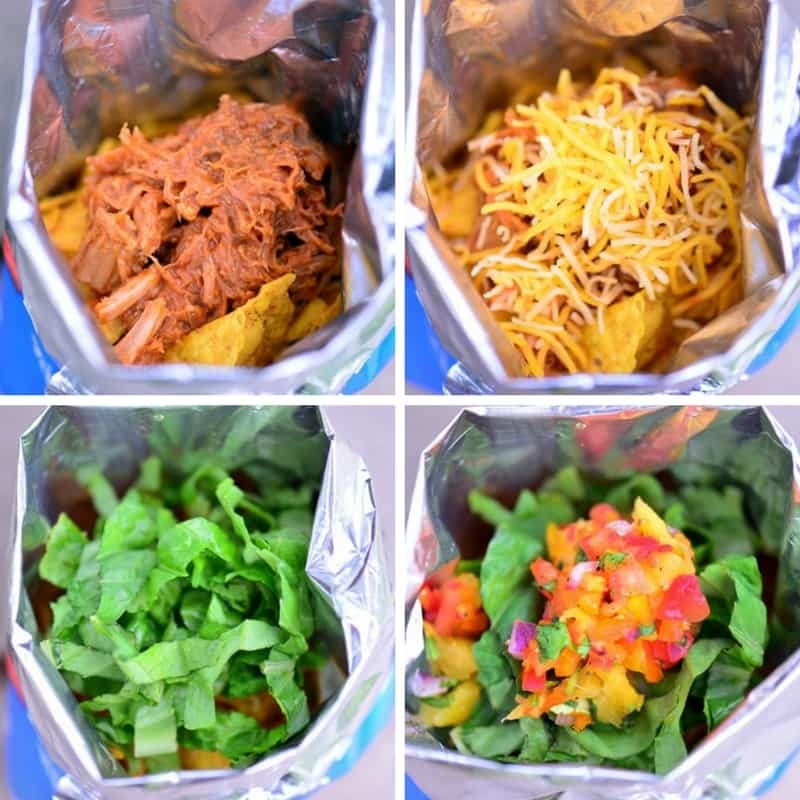 The first stop on the Hawaiian BBQ Walking Taco Bar is the basket of bagged chips. Next, is the Byron’s Pork BBQ. 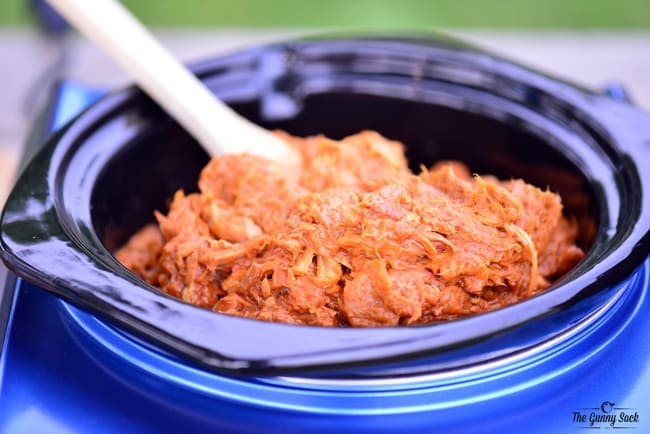 If you have access to electricity, you can even put the barbecue pork in a slow cooker to keep it warm. The third item in the walking taco bar is the toppings. There is pineapple salsa in a bowl made from a hollowed out pineapple (you can find my recipe here: Pineapple Salsa). I put shredded lettuce, shredded cheese, chopped cilantro and sour cream in mason jars on a tray. I used mason jars because I could put the lids on the jars for easy transporting and to keep the bugs out. I also added large mason jars with napkins and plastic forks. At the end of the walking taco bar, I filled a bucket with water bottles and ice. Assembling a Hawaiian BBQ Walking Taco starts with a small bag of chips (you can use whatever kind of chips you want). Open the bag of chips and crush them into smaller pieces. Fold down the sides of the bag to make it more sturdy. Top the chips with Byron’s Pork BBQ, shredded cheese, shredded lettuce, pineapple salsa, sour cream, and cilantro. Grab a fork and dig in! 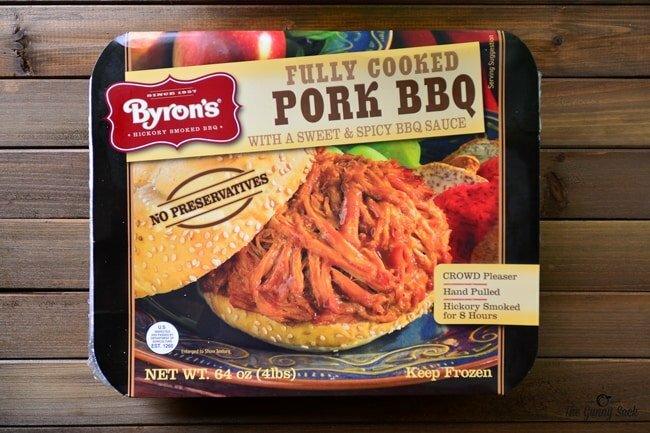 Byron’s Pork BBQ makes the prep easy and clean up is super easy too. Just put the chip bag and the plastic fork in the trash when you are done eating. 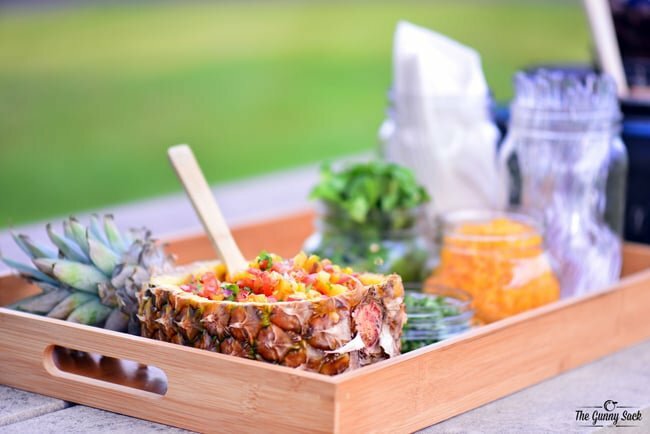 These Hawaiian BBQ Walking Tacos are the perfect thing to serve at your next backyard bash. Heat the pork barbecue according to the instructions on the package. Open the bag of chips and crush them into smaller pieces. Fold down the sides of the bag to make it more sturdy. Top the chips with the pork barbecue, shredded cheese, shredded lettuce, pineapple salsa, sour cream and cilantro. Doing this for a camping trip, but what chips should be used? Want to make sure they pair up good with the recipe. We used Cool Ranch and Nacho Doritos. Enjoy! This looks so good! What kind of chips do you use? We used bags of Doritos! This dish sounds so summery! 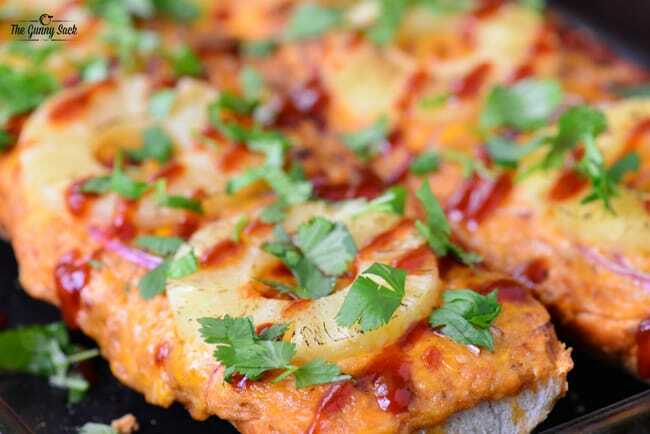 I am loving the hawaiian twist on the pulled pork! Sounds amazing! Thanks Michelle! They are fantastic! Okay, these just sound awesome! Thanks Cathy! I loved them! So much deliciousness in the one meal! Yum! Yes! It sure it! Thanks Andi! Tacos are a favourite meal at my house, and these ones look fantastic! These are so fun! I love how easy they are! And the hawaiian flavors sound delish! Pinned! What great party food! I have never had a walking taco before but they sound like a ton of fun, I’m sure my kids will love them. Walking tacos?! This is seriously the best…idea…ever! Pinned! OMG! I would totally eat these for breakfast right now. LOVE how quick and easy these are. YUM! !